Abscess Tooth is a sort of tooth infection resulting in accumulation of pus. This painful condition is generally caused by severe tooth decay. The bacterial infection leading to Abscess Tooth is usually present at the root of a tooth or between the gums. At times, the root of the infected tooth dies due to the infection and the toothache subsides on its own. This relief from pain does not mean that the infection has also healed. In fact, the infection could still the active underneath and may spread to other surrounding tissues. Therefore, Tooth Abscess should not be ignored merely on the basis of temporary absence of symptoms. So, timely treatment of Abscess Tooth can help avoid many other complications related to toothache. Usually, the conventional treatments are adopted for this purpose. 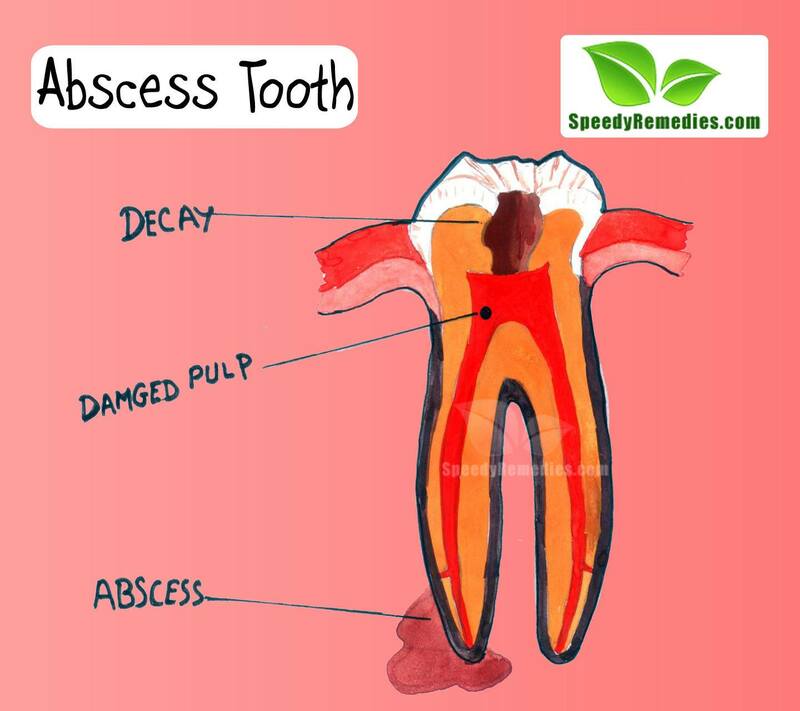 However, apart from these treatments, a number of natural home remedies for Abscess Tooth have also been found beneficial in the natural treatment of Abscess Tooth. In fact, the natural remedies for Tooth Abscess have been in use since time immemorial and hence are completely safe to follow. Severe tooth decay and tooth trauma are the most common causes of Abscess Tooth. As mentioned above, tooth decay characterized by infection and accumulation of pus is one of the main causes leading to Abscess Tooth. Tooth trauma, on the other hand, refers to a broken or chipped tooth that causes openings in the tooth enamel where bacterial infection takes place. Dental Abscess could also be caused by gum diseases like Gingivitis. Presence of tooth abnormalities and improper oral hygiene also contribute in causing Abscess Tooth. Weak immune system and certain autoimmune disorders may also encourage bacterial infection leading to Abscess Tooth. The presence of a sharp, throbbing tooth pain in the affected tooth is one of the most common and equally troublesome symptoms of Abscess Tooth. Other symptoms include swollen neck glands, swollen upper or lower jaw area, tenderness in the affected tooth and the surrounding area, gum inflammation, pus drainage, sensitivity of the tooth in terms of hot or cold food items, presence of foul and bitter taste in the mouth, fever and a general feeling of discomfort or uneasiness. • Applying crushed garlic around the infected tooth is one of the most effective natural home remedies for Abscess Tooth. • Similarly, placing a slice of onion on the infected also cures Abscess Tooth naturally by healing the infection. • Washing the mouth with the help of dilute hydrogen peroxide helps in the home treatment of Abscess Tooth. • Clove oil is regarded as one of the best home remedies for Abscess Tooth related Toothache. Apply this therapeutic oil carefully only on the painful area to get rid of the pain. However, do not use this natural remdy in case there is bleeding in the tooth. Tea tree oil also serves as a good Abscess Tooth home remedy. • Cloves can also be used in combination with ginger in order to heal Abscess Tooth. For this, take about three or four cloves and a piece of ginger and boil these ingredients in a cup of water until the quantity of water reduces to half and becomes light brown in color. Cool this solution and use it on a regular basis for gargling. Simply holding a clove around the affected area is also beneficial in this regard. • Placing chilled tea bags on the affected area for about 10 minutes is perhaps one of the most popular home remedies for Abcess Tooth. Other cold compresses also help to reduce Abscess Tooth related pain. • Gargling with warm saline solution is one of the most widely used Abscess Tooth home remedies. Saline solution helps inhibit bacterial growth in a natural way. • Grapefruit seed extract and peppermint extract are highly beneficial home remedies for Abscessed Tooth. Gargling with these extracts helps to relive tooth pain immediately. • Add a quarter teaspoon of potassium carbonate in half a glass of water and use this solution for gargling. This solution serves as an excellent natural cure for Abscess Tooth by dealing with the underlying bacterial infection. The diet for dealing with Abscess Tooth should focus on the inclusion of healthy and nutritious food and exclusion of sugary foods and drinks. Various studies have found that the consumption of cashew nuts is highly beneficial in the natural treatment of Tooth Abscess. Besides, cigarette smoking and tobacco abuse should be avoided as far as possible because they tend to increase the risk of developing gum diseases. Moreover, maintain adequate oral hygiene by properly brushing and flossing the teeth on a regular basis. In addition, consume plenty of water throughout the day in order to avoid dry mouth that contributes in causing several periodontal issues.